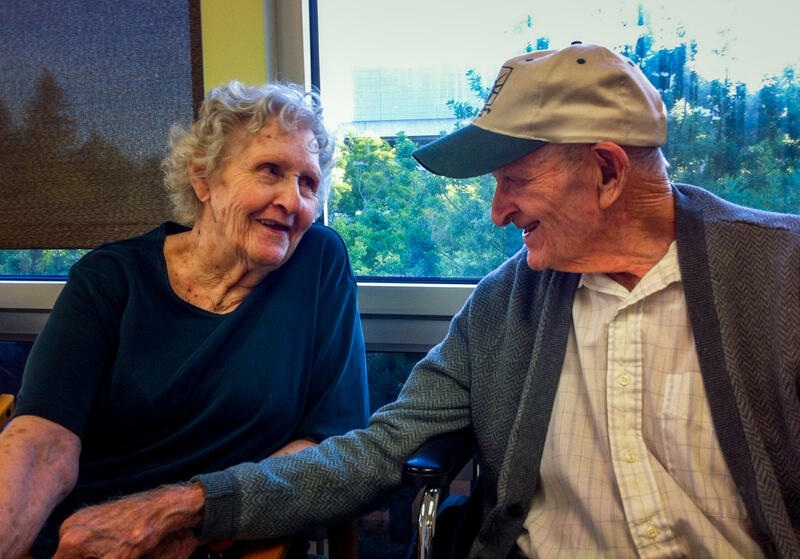 Gloria Single and her husband Bill Single in the dining hall of the skilled nursing floor at Pioneer House nursing home in Sacramento. AARP Foundation attorneys say California needs to more tightly enforce laws that prohibit evictions of the sort that separated the Singles, and sped up her physical decline. Her situation isn't unique. Nationwide, eviction is the leading complaint about nursing homes. In California last year, more than 1,500 nursing home residents complained that they were discharged involuntarily. That's an increase of 73 percent since 2011. Gloria Single has a number of ailments. One of them is Alzheimer's disease. So when her son Aubrey Jones comes to visit her in her new nursing home, he brings old photos to show her. She can still recognize faces from long ago — one picture shows her three sons when they were just little kids. Jones says the photograph makes him and his brothers look like real troublemakers. "You are troublemakers," his mom teases. Jones also shows his mother a more recent photo. It was taken at Pioneer House, the nursing home where Gloria Single and her husband Bill lived together before her eviction. They're gazing into each other's eyes and smiling. When Jones tells her he loves that photo, Gloria Single slyly replies that's "because [Bill's] got his hand on my knee." In court documents, Pioneer House paints a more troubling picture of Gloria Single. They say that she became aggressive with staff and threw some plastic tableware. So Pioneer House called an ambulance and sent her to a hospital for a psychological evaluation. The hospital found nothing wrong with her, but the nursing home wouldn't take her back. They said they couldn't care for someone with her needs. Jones protested his mother's eviction to the California Department of Health Care Services. The department held a hearing. Jones won. "I expected action — definitely expected action," says Jones. Instead, he got an email explaining that the department that holds the hearings has no authority to enforce its own rulings. Enforcement is handled by a different state agency. He could start over with them. This Catch-22 situation attracted the interest of the legal wing of the AARP Foundation. Last year, attorneys there asked the federal government to open a civil rights investigation into the way California deals with nursing home evictions. Now, they're suing Pioneer House and its parent company on Gloria Single's behalf. It's the first time the AARP has taken a legal case dealing with nursing home eviction. "We certainly hope we can get Mrs. Single some relief," says William Alvarado Rivera, the foundation's senior vice president for litigation. "But we also hope that there is a lesson to be learned by facilities — that there will be accountability for their failure to respect the due process rights of their residents." Nursing home residents have a lot of rights guaranteed in state and federal law. For example, they have to be given 30 days' notice before they're moved involuntarily. And the nursing home has to hold their bed for a week if they're in the hospital. Rivera says Gloria Single didn't get any of that. As a result, she was stuck in the hospital for four and a half months before being accepted by another facility. During that time Single received none of the services and activities she would have had in a nursing home. She lost her ability to walk and now relies on a wheelchair. Rivera says that "in the absence of state enforcement, it will depend on individuals like Mrs. Single having to advocate for themselves to get their rights respected and enforced." Fourteen years of public records obtained by NPR show that nursing homes rarely pay a price for illegally evicting residents. Just 7 percent of nursing homes that were found to have violated the law in California were fined by the state. With just a couple of exceptions, the highest fines assessed were $2,000. The majority were $1,000 or less — and most fines were never paid in full. Diana Dooley, California's secretary of health and human services, declined NPR's request for an interview, citing pending litigation against the state on a similar issue. Frustration with the lack of state enforcement led the California Long-Term Care Ombudsman Association to join the Single lawsuit as a co-plaintiff. The organization represents long-term-care ombudsmen. Those are the public officials who track complaints about nursing homes and advocate for residents. But Leza Coleman, the group's executive director, says the spike in complaints about evictions is so overwhelming, that it's "impacting our ability to handle other complaints." Coleman believes another reason that eviction complaints are going up, is that the number of nursing homes is going down. State records show there are about 2,300 fewer beds in California than there were six years ago. "Those residents that are more challenging — those that have to be repositioned often, those that don't want to sit quietly and watch television — ... they're more expensive," she says. "They can be very taxing on the staff of a facility, and if a facility has one bed and two people looking at it, they're going to take the person that's easier to care for." But eviction complaints need to be seen in a different context, says Jim Gomez, CEO of the California Association of Health Facilities. "We have a very low rate of complaints regarding discharge," he says, adding that roughly 1,500 complaints is "less than a half of 1 percent of some 300,000 discharges" a year. And when residents are involuntarily discharged, Gomez says, "it's for the safety of staff and other residents. "We've had many attacks on residents and staff," he says. "Are you going to allow that person back to the facility?" Pioneer House and its parent corporation, the Retirement Housing Foundation, declined to be interviewed for this story. They sent a written statement which says, in part, "We intend to vigorously defend the allegation set forth in the lawsuit." Meanwhile, Aubrey Jones says the lawsuit is not just about his mother any more. "If anything," he says, "I want the dial to be turned a little bit so this thing doesn't happen again --[so] it's less likely to happen to someone else." Most of all, Jones says, he wants to see his mother and stepfather reunited, so they can be together for the little bit of time they have left. Tomorrow, a California judge could decide if Gloria Single will be reunited with her husband, Bill. She's 83. He's 93. The two lived in the same nursing home until last March. That's when Gloria Single was evicted without warning. NPR's Ina Jaffe covers aging and reports that in California, complaints about nursing home evictions have jumped 73 percent in just a few years. INA JAFFE, BYLINE: Gloria Single has dementia. So when her son Aubrey Jones visits her in her new nursing home, he brings old photos. She still recognizes faces from years ago, like when her three sons were little kids. AUBREY JONES: Look like troublemakers there, the three of us. GLORIA SINGLE: You are troublemakers. JAFFE: But then Jones shows her a recent photo. It was taken at Pioneer House, the Sacramento nursing home where Gloria Single and her husband, Bill, lived before her eviction. JONES: I love this picture of you and Bill together. SINGLE: Because he's got his hand on my knee. JAFFE: In court documents, Pioneer House paints a different picture of Gloria Single. They say she was aggressive with staff. When she threw some plastic tableware, they sent her to the hospital for a psych evaluation. The hospital said she was fine, but Pioneer House wouldn't take her back. They said they couldn't care for someone with her needs. So Aubrey Jones protested to the California Department of Health Care Services. The department held a hearing, and Jones won. JONES: I expected action - definitely expected action. JAFFE: Instead, Jones got an email explaining that the department that held the hearing has no authority to enforce its own ruling. Enforcement is the job of a different state agency. Jones could start over with them. That's why the legal wing of the AARP Foundation is now suing Pioneer House on Gloria Single's behalf. William Alvarado Rivera is the foundation's senior vice president for litigation. WILLIAM ALVARADO RIVERA: There is a lesson to be learned by facilities that there will be accountability for their failure to respect the due process rights of their residents. JAFFE: And by law, nursing home residents do have rights. For example, they get 30 days' notice before they're moved involuntarily. And if they're in the hospital, the nursing home must hold their bed for a week. Rivera says Gloria Single didn't get any of that and was stuck in the hospital for four and a half months. RIVERA: In the absence of state enforcement, it will depend on individuals like Mrs. Single having to advocate for themselves to get their rights respected and enforced. JAFFE: Public records obtained by NPR show that California nursing homes rarely pay a price for illegally evicting residents. Just 7 percent of facilities that violated the law were fined. Most of the fines were $1,000 or less, and most were not paid in full. California's Secretary of Health and Human Services declined NPR's request for an interview. But Jim Gomez defends the way the state enforces the law. JIM GOMEZ: It's not lax. I think it's about right. JAFFE: He's the CEO of the California Association of Health Facilities, which represents most nursing homes. He says that some residents are evicted because they're a danger to others. GOMEZ: When the Department of Public Health reviews that, they say, this was a reasonable decision because it does not make sense for that person to come back here. JAFFE: Pioneer House and its parent company declined to be interviewed. Their written statement says, in part, we intend to vigorously defend the allegations set forth in the lawsuit. As for Aubrey Jones, he says the suit isn't just about his mother anymore. JONES: If anything, I want the dial to be turned a little bit so this actually is less likely to happen to someone else. JAFFE: Though most of all, he wants to see his mother and stepfather reunited for the little bit of time they have left. Ina Jaffe, NPR News. (SOUNDBITE OF SUFJAN STEVENS SONG, "CONCERNING THE UFO SIGHTING NEAR HIGHLAND, ILLINOIS") Transcript provided by NPR, Copyright NPR.